There are several pictures of wedding centerpieces in cheap wedding centerpieces with flowers, candles, fruit, plants and much more. Have a look around and see if there are any that fit your style and colors. There may not be the exact centerpiece that you are looking for but you can always take elements from different centerpieces and mix them up. A picture can be the kick start you need to get started on choosing your wedding centerpiece. 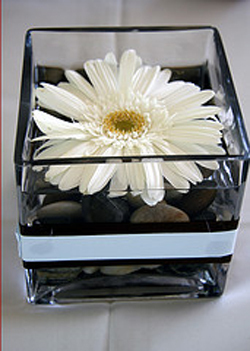 Take this picture of the daisy in the square vase, so simple but you could easily reproduce the look. Maybe change the ribbon color, have hydrangeas instead of daisies or a floating candle instead. You could have glass pebbles, although the natural look in this wedding centerpiece makes it for me. Can't find square vases? Use round instead. 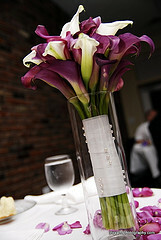 Or even just take away from this image the ribbon around the vase, instead of ribbon it could be lace or twine. And this is a great way to decorate old jars to use as a vase for a centerpiece. This picture could be the starting point of thousands of different centerpiece ideas, we could all come up with a similiar but different design. 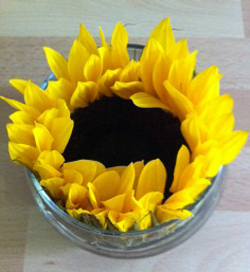 One idea that has come from this picture is this sunflower centerpiece where I have used a round vase. I love creating centerpieces with large headed flowers as they fill the vase and then you don't have to worry about arranging them. Which makes it less stressful! Sunflowers are great too as they last for ages. To prove a point the one in the picture I had already had for a week before I put this together. Don't just look at photos of wedding centerpieces, especially if your wedding has a theme because a typical wedding centerpiece might not work as well at a very themed wedding. Here your centerpiece is going to be based on your theme so use that as your inspiration. 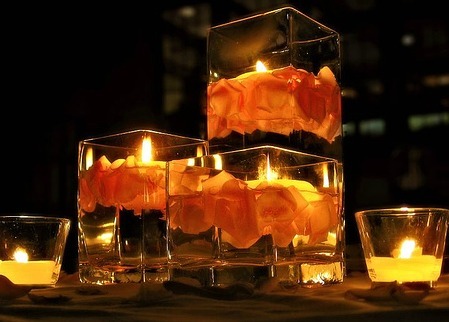 Take a look at these ideas for inexpensive centerpieces. Sometimes wedding pictures make you say "that's a good idea!" Take this picture of the stunning purple flowers, using your wedding bouquet as your wedding centerpiece is a great way to save money, and you could take it a step further by having your bridesmaids bouquets as centerpieces for the other tables. You could also use a bouquet to decorate the cake table or the table where you have your guest book. And while we are on the subject of using your flowers in more than one place, don't forget any flowers from your ceremony. A pedestal arrangement could be reused to decorate behind the top table or at the entrance and a table arrangement could be used on your top table. Don't forget that centerpieces don't have to be just flowers, candles are the next most popular item for a wedding table. And with candles simple is best. This centerpiece would be really easy to put together yourself. You can use silk or real rose petals to float in the vases. Don't submerge freeze-dried petals as they will absorb some of the water and may loose their color. If you wanted to use taller vases then you may want to have pebbles at the base of the vase otherwise there will be a lot of empty space. As well as rose petals you could use cranberries which would be perfect for a Christmas wedding and they will look as fresh at the end of the night as at the beginning. 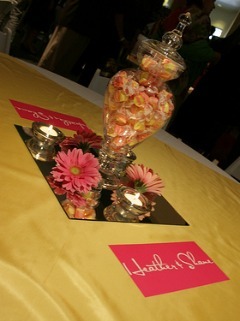 This candy jar looks great decorating the tables and the color of the candy matches their colors. The table runner and the couples name cards match too. Giving a really lovely coordinated centerpiece and table decoration. The candy can then end up being your guests' favors too. Instead of place cards you could have a paper bag with their name on so they can take some home with them too. You just know that the children will have fun! It is worth remembering that your table decorations are not just your centerpieces they are also the table linen, your favors, table names or numbers, place cards and anything else you have on your table for your guests. Make sure your table is not too busy otherwise the overall look will get lost. But have fun too! You get the idea, look at lots of pictures, find your inspiration, tweak it and you have the perfect centerpiece for you. Don't forget to send us in a picture so we can say, "Why didn't we think of that?!"